In the video, the girl makes the comment “It’s going to hurt really bad, especially for the first few days, and you’re going to want to give up, but don’t, because it’s totally worth it in the end.” I cringe when I heard her say this. While I believe that her heart is in the right place—I recognize that braces are expensive and she found something exciting that seems to be working for her—the advice she is doling out can have some terrible consequences. The rubber bands technique advocated in this video could actually cause tooth loss and significant gum damage. Orthodontists go through rigorous training programs that take them two to three years to complete, in addition to the four years of dental school that they must first finish before being accepted into orthodontic programs. Having successfully completed several orthodontic classes as part of my own general dentistry curriculum, I can tell you that straightening teeth is not nearly as easy as it looks. 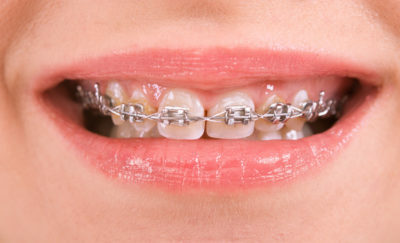 There is a good deal of calculation, individual case planning, precision execution, and careful timing that goes into every single person who gets treated with braces. Orthodontic care is expensive for a reason and I believe it is well worth the money. How much is an attractive smile worth? How much would you pay to protect that smile? How much is it worth to you to be able to chew food well? How much money would you pay to get your teeth back if you suddenly lost them and could not talk or chew properly? If you think of dental care, including orthodontics, on these terms, I think you’ll find that what you actually pay in dental and orthodontic care costs is much less than the value that you place on your teeth. One of the best uses for money is to invest it on yourself, especially when it comes to preserving and protecting your health. Many surveys and studies have shown that among the biggest regrets elderly people have, failure to be healthy and protect health is high on the list. Don’t let this happen to you. If you are in need of orthodontic care and for some reason cannot wait to save up for such an investment, I highly suggest you call one of these offices and schedule a consult rather than trying a “do it yourself” technique for straightening your teeth.